Upper: Mesh, synthetic leather, high density printed layers, midfoot half-sleeve/gusset. 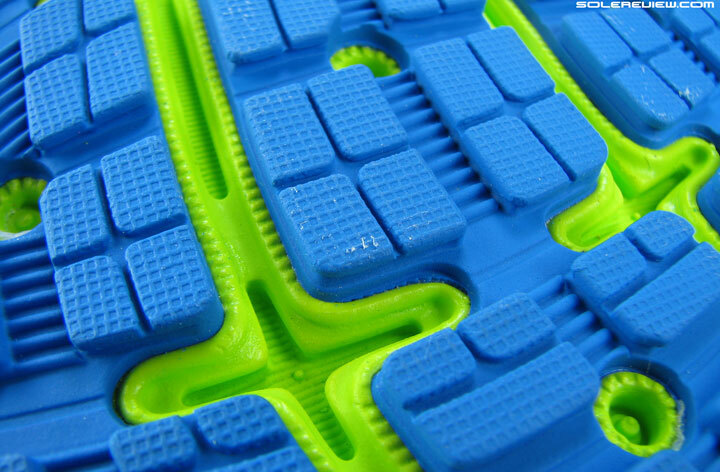 Midsole: Dual density compression molded EVA midsole. 10 mm heel to toe offset. Widths available: Narrow - B, regular - D (reviewed), wide - 2E. The Glycerin 13 might merely appear to be a mid-life facelift, but there's more to than meets the eye. The ride is much softer than last year's model, and the upper forefoot fits narrower. Looks like a Glycerin 12 nip-and-tuck, but there’s more to the story. Read you must. On the basis of looks alone, the Glycerin 13 is likely to be perceived as a minor update applied to the Glycerin 12 template. But one needs to quickly dispel that notion – because despite the shared visual lineage, the Glycerin 13 is actually very different from the last year’s model. To bring everyone upto speed, the Glycerin 12 was Brooks’s first attempt at transitioning this popular model from a Gel based ‘DNA’ insert to a ‘superDNA’ foam midsole. The results weren’t particularly spectacular, and considerably distanced from the superlative standards set by versions such as the Glycerin 10. 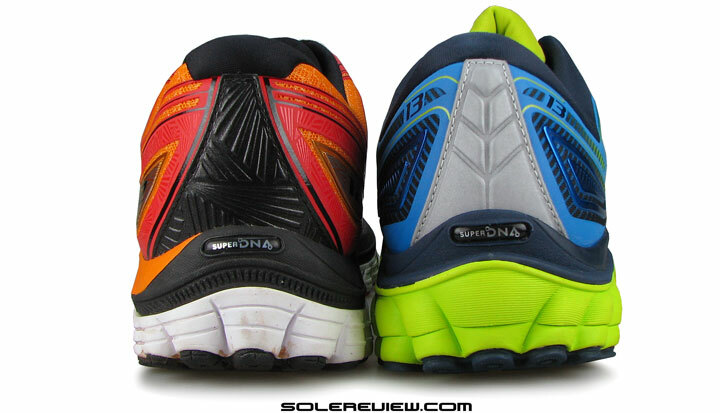 Comes with a compression molded EVA midsole, which Brooks calls SuperDNA . The Ghost 8 uses BioMogoDNA. What’s the difference? Not quite sure. For a shoe positioned at the pointy end of Brooks’s neutral running pyramid, the Glycerin 12’s midsole foam felt dead, and far from the promised land where a plush ride ruled supreme. The 2014 G-12 was actually a relatively firm riding shoe – while there was nothing wrong with that, the experience disagreed with the shoe’s marketing plug. On the upper side of things, the situation was far better. In the past, we’ve reviewed Glycerin versions 8-12, and Brooks has been consistent in pairing a plush and beautiful looking upper with the sole unit. 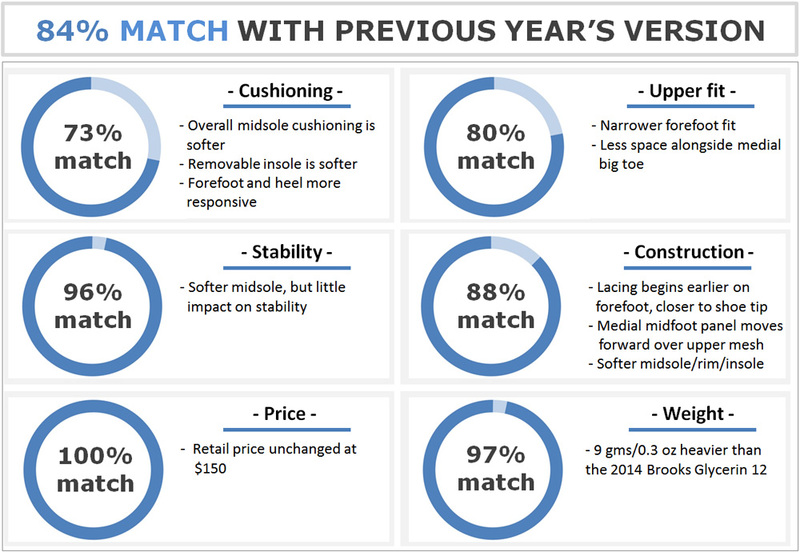 Brooks materials have always felt premium, never mind other areas of shortcomings. The 2014 Glycerin 12 was no different, and presented itself with a gorgeous looking upper mated to the all-foam midsole. 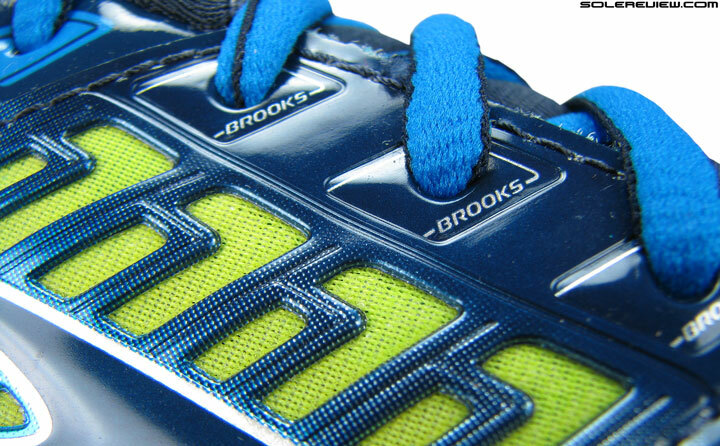 The quality of upper materials has always been Brooks’s forte. That plush-upper approach hasn’t changed on the Glycerin 13, and the newest version also arrives with a material and design package which looks very familiar. A lot of the similarity is attributed to common part sharing and construction techniques with the outgoing G-12. However, there are fit changes in more places than one, so not everything is same on the G-13. The articulated pod design of the midsole is borrowed from the G-12, yet packs in major functional changes. 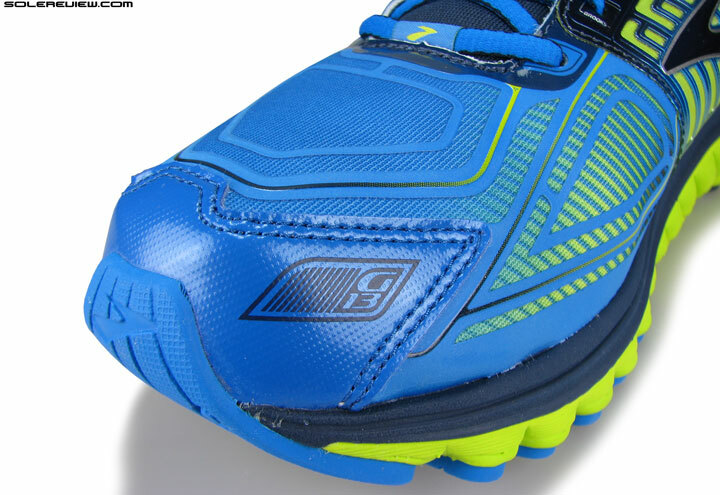 As for the ride itself, there is a noticeable transformation in the Glycerin 13’s personality. So if the entire sole unit looks strikingly similar to last year’s offering, what brings about the difference in ride quality? The changes are literally layered over one another, and the details slowly emerge as you put on the miles over the course of multiple test runs. 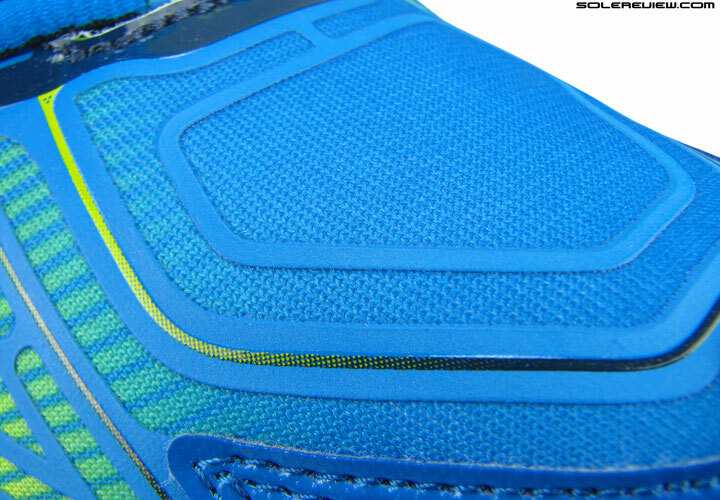 Identical Glycerin 12 insole design, only this time with a softer foam density. 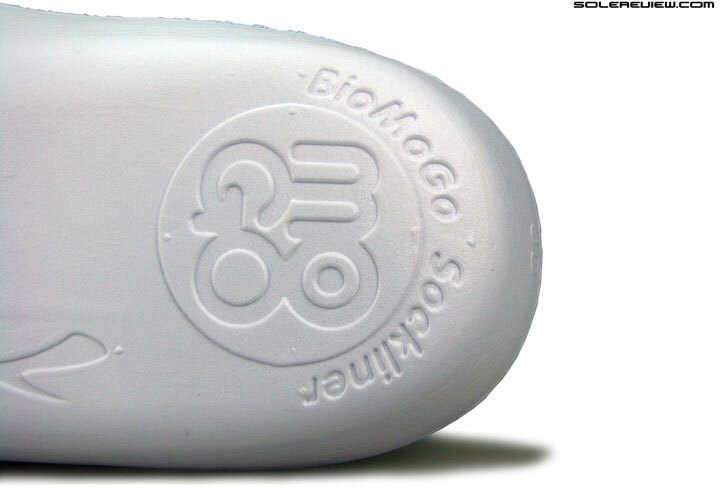 BioMogo foam is claimed to be landfill friendly. Smooth foam texture, different from the open-celled construction we’re used to seeing lately. Foam lasting below the insole, and the midsole lies yonder. You’ll notice that the removable insole is softer, regardless of the design sameness. There’s more squish packed within those foam cells, which promptly becomes evident once you rest your body weight on the footbed. Below the insole and foam lasting, the midsole foam density has been softened up, heightening the sensation of underfoot padding. 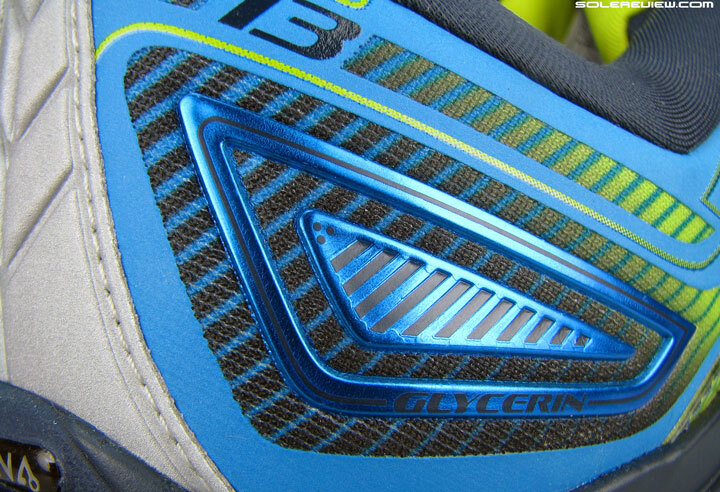 There’s a separate foam rim lining the top midsole, but it has been slimmed down and made softer on the G-13. 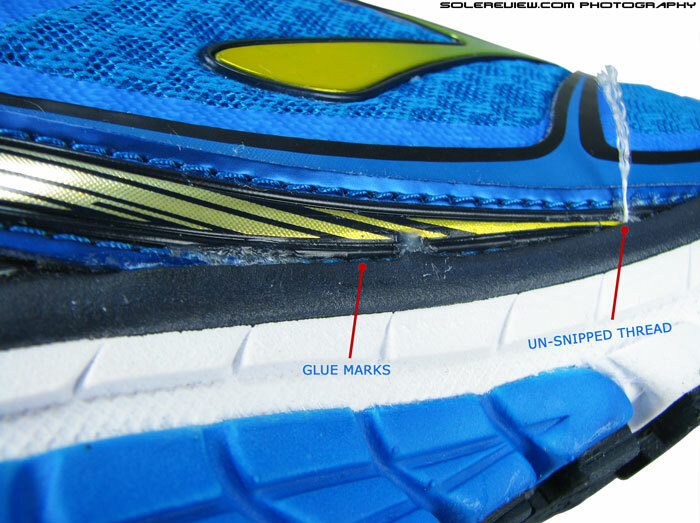 This also means that the main midsole gets a bump-up in bulk on the Glycerin 13 (right). Summary: Bigger midsole, smaller rim. 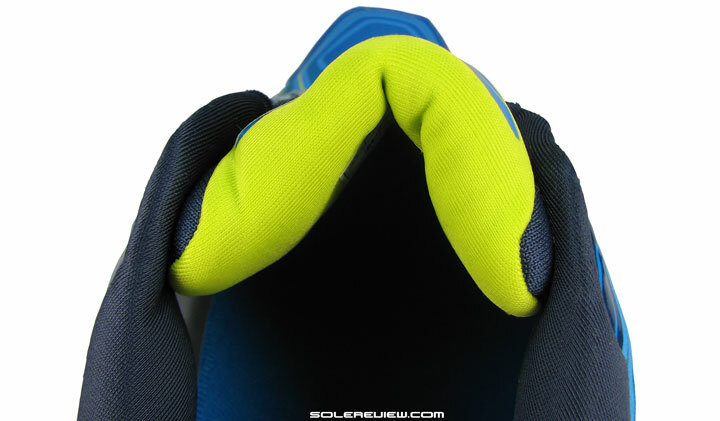 This change is infused in both the layers of the midsole; the top part or the rim (deep blue) which borders up the upper edges, and the lower base (lime green) which serves as the primary cushioning layer. And there’s an update on the midsole design itself – specifically in the ratio of how the rim and midsole are stacked together. 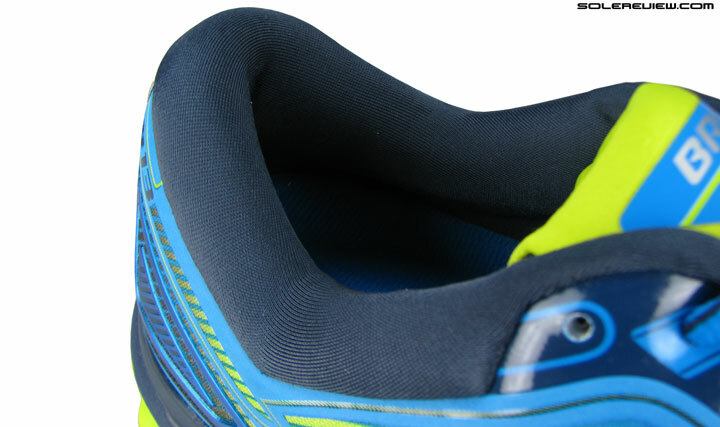 On the Glycerin 12, the upper rim was much thicker under the rear-midfoot area, and firmer in density than the midsole foam below. 1) Softer forefoot 2) The midsole rim has been made thinner and softer. 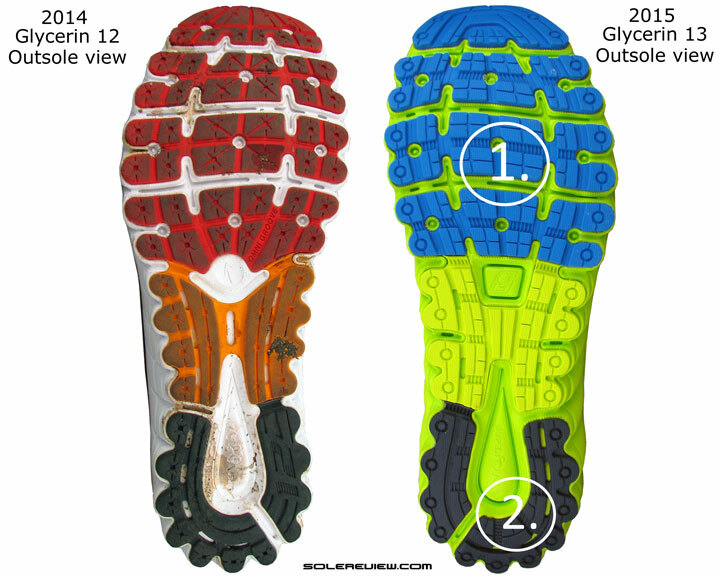 In comparison, the Glycerin 13 rations down on much of the rim’s bulk, making it thinner and allocating that margin to the lower (and now larger) midsole. This, when put together with the increased softness of foam, makes a substantial change in the way the Glycerin 13 behaves. The move-up in softness is immediately noticed, making for a far plusher ride than what the 2014 model had to offer. The cushioning isn’t super soft, however. We say this because a lot of runners stay away from shoes which feel overtly marshmallow-ey (Nimbus 17), and they need to know that Glycerin 13 isn’t one of those shoes. The Glycerin 13 is not mushy. If we had to imagine a comparative scale using the Glycerin 12, Vomero 10, Glycerin 13 and the Nimbus 17 as markers, the newest Glycerin would be somewhere between the Glycerin 12 and the Vomero 10. Meaning that within this pack of four, the G-12 and Nimbus 17 are the firmest and softest respectively, and the Glycerin 13 is softer than the G-12, but firmer than the Vomero. Consistent midsole density makes the Glycerin 13’s ride a smooth affair. 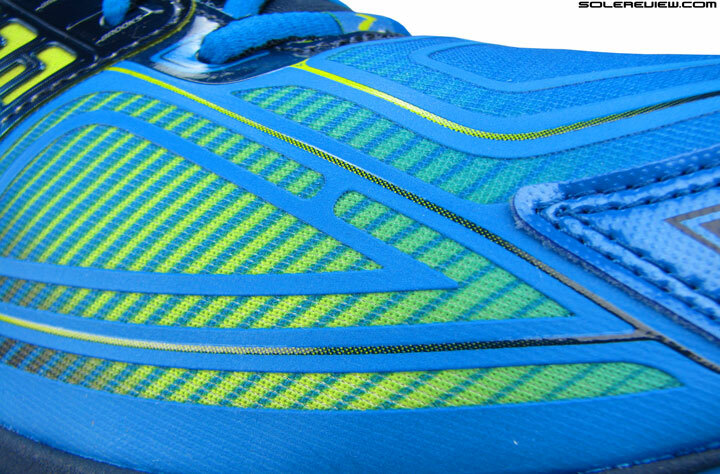 Transitions are smooth on the Glycerin 13, a positive by-product of midsole consistency along the shoe’s length. There aren’t any soft or hard pockets, and this allows weight loading to progress seamlessly. But the Glycerin 13 still feels a bit sluggish, and we blame that on the shoe’s weight. Last year’s Glycerin 12 was heavy enough at 340 gms/12 Oz, and Glycerin 13 upstages that by packing in an extra 9 gms/0.3 oz. This tips over the Glycerin 13 from borderline 12 oz territory to a proper 12 Oz+ shoe for a US size 11. Naturally, for smaller sizes – say 8,9 and 10 – the weight will be sub-12 Oz. 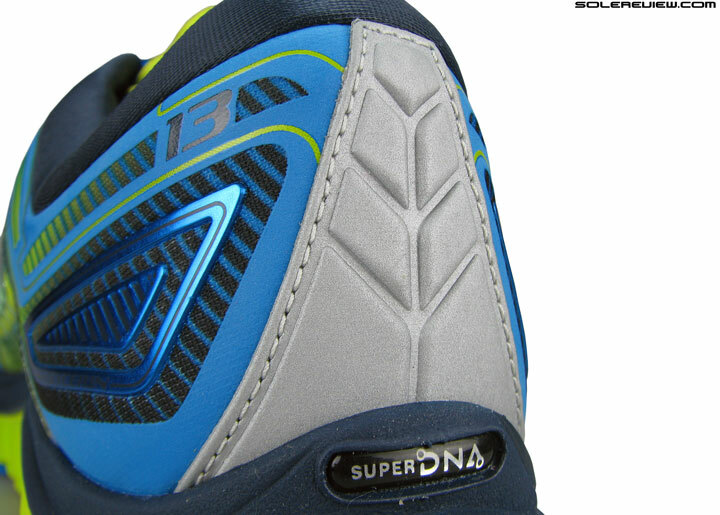 Look past the SuperDNA foam’s lack of charisma, and the Glycerin 13 is actually a very good shoe. While this isn’t the most suitable shoe for speed running duties, the Glycerin 13 plays the role of a padded, daily workhorse rather well. The chunky midsole absorbs the imperfections of the road without bottoming out, and weight loading/transitions/footstrikes in either direction happens sans any negative drama. Supportive midsole design keeps lean/bias at bay. It also happens to very supportive for a ‘neutral’ shoe; the raised midsole rims keep the foot seated securely, and the optimal foam density+sidewall design keeps the foot from being tossed around on footstrike and the ensuing transition. 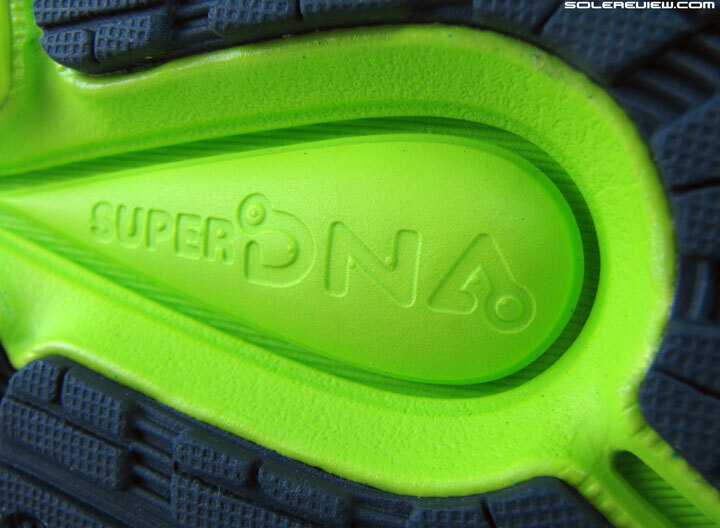 We still have difficulty understanding what the new, foam based DNA cushioning does. Brooks made the switch to this new compound last year, and while the brand spun around lofty adjectives such as ‘adaptive cushioning’ and ‘thousands of nano-springs’, the ground reality did not seem to agree with the hyperbole. The foam feels like any other compression molded EVA foam, and lacks the special effects which accompanies materials such as adidas Boost or Nike Zoom Air. This isn’t to say that the latter isn’t without flaws; adidas has been pasting mediocre uppers over Boost midsoles of late, and Nike Zoom Air has limitations of its own, like a restricted spread of cushioning delivery and unnecessary stiffness. Yet, the conversation is about isolating that something special, and DNA falls short here. The fact that Brooks actually had to soften the density of their SuperDNA foam to make it more comfortable over previous year’s model speaks volumes about their ‘technology’. At a fundamental, functional level, it is hard to substantiate whether one cushioning material is better over another. But given the fact that a $80 running shoe will do as good as job as a $150 shoe for all practical purposes, the justification of a $150 tag is usually in the form of a sensory theatric or an unmistakable performance benefit. For most road going running shoes, it is most about how the shoe feels, rather than actual performance benefits like impact protection. If any of the latter can be measured at all, that is. But we have a feeling most know this fact, yet the standard expectation includes the shoe making good on its high price – one way or the other. 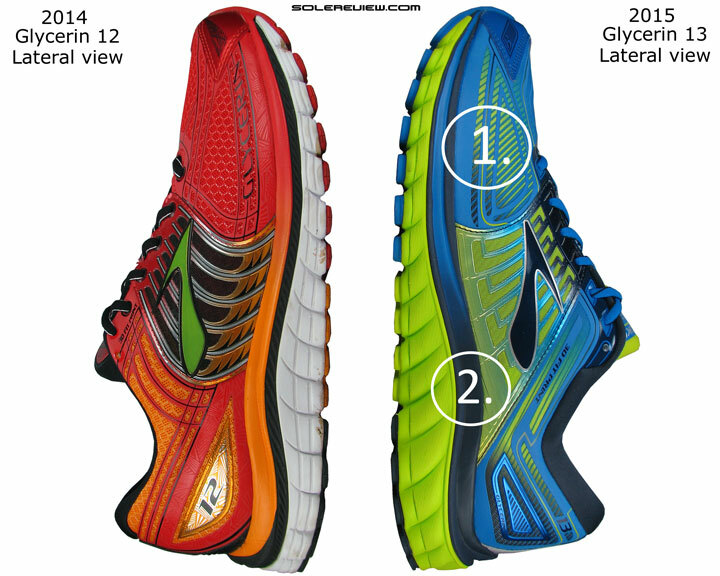 The verdict on the Glycerin 13? Not bad at all. 1) Softer forefoot 2) Greater midsole bulk and increased softness results in a more padded heel. Blown rubber under the forefoot and harder rubber on the heel underside. Performs well on grip, though of lower long-term durability. 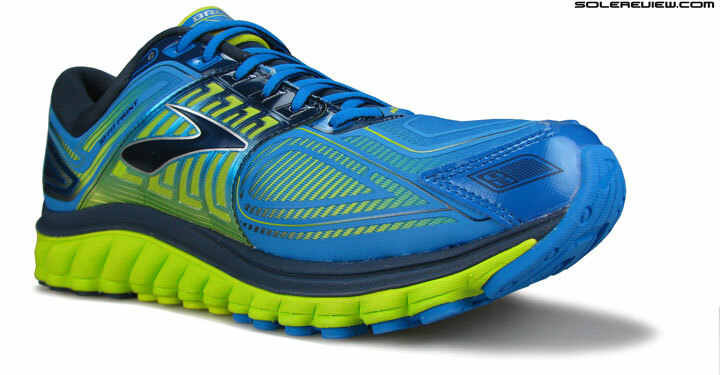 But if you disregard the whole superDNA debate, then the Glycerin 13 turns out to be actually a very nice shoe. It lines up (more or less) with expectations of a plush and smooth ride, and has the premium packaging of materials worthy of the credit score denting price tag. This is a good product to go do your daily runs in, no matter what the distance. The underside sports the familiar outsole layout of soft rubber under the forefoot and firmer rubber under the heel, with plenty of grooves. There’s enough grip, though that will probably come at the cost of outsole durability, an experience we’ve had on past editions of the Glycerin. This might be the opportune time to point out that the superDNA foam does seem to differ from the cheaper Ghost 8’s ‘BioMogo DNA’. The Glycerin 13 rides perceptively much softer and smoother than the Ghost 8, though it is hard to say whether this is due to the foam density or the material composition itself. After all, the Ghost 8 does have a relatively firmer density midsole – that alone could make up for the entire difference in feel. 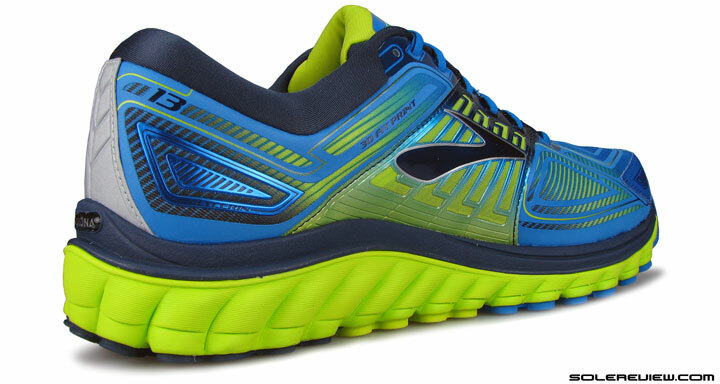 On a related note, the evolution of Glycerin 13 feels like the opposite of what the Brooks Transcend did. 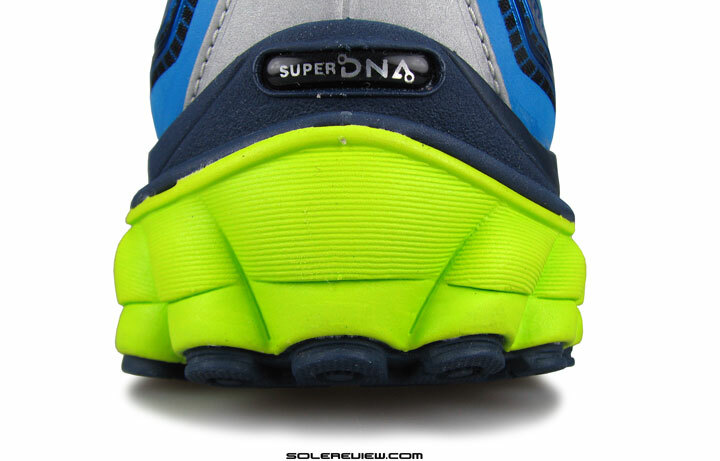 The Transcend SuperDNA went from soft to firm across the 2014 and 2015 models, changing the ride quality quite a bit. We’ll willing to bet ten dollars that the Transcend will turn soft again in a matter of few months. So far, so good, and that is a fair sum-up the Glycerin 13’s ride. There are changes on the Glycerin 13’s upper too, so we reckon you’d like to stick around for that. 1) Early lacing shortens the open mesh area 2) Wider lacing and changed eyestay design increases lockdown pressure 3) Achilles dip gets a small dose of firmness. The fit of the Glycerin 13 has changed. In a way that makes the new upper snugger fitting in the forefoot. There isn’t a major fit difference in the remainder of the upper, areas like the midfoot and heel. There are updates in those parts, but not as significant as what occurs in the front. The usual suspects end up influencing the forefoot fit. 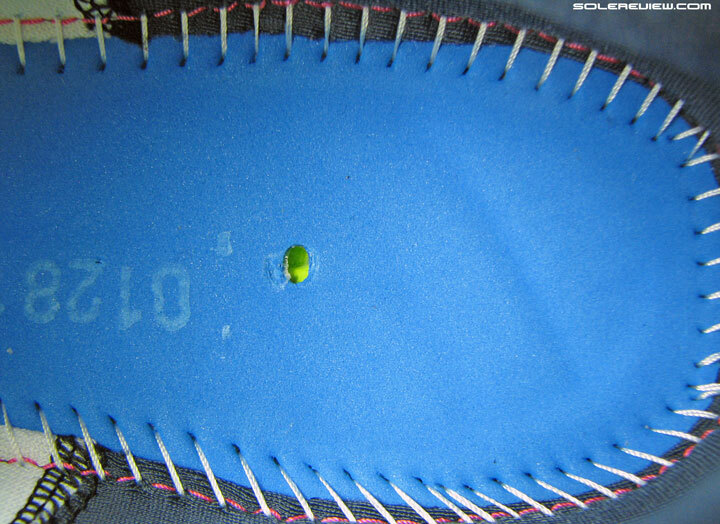 The first is the shortened distance between the tip of the shoe and the start of lacing. This change moves the lacing forward by a few millimeters, and the obvious after effect is more grip over the forefoot. In short, decreased mesh expanse on the G-13 vs. the G-12. Forefoot is a narrower place on the Glycerin 13. Why? Change in position of lacing and midfoot panel. 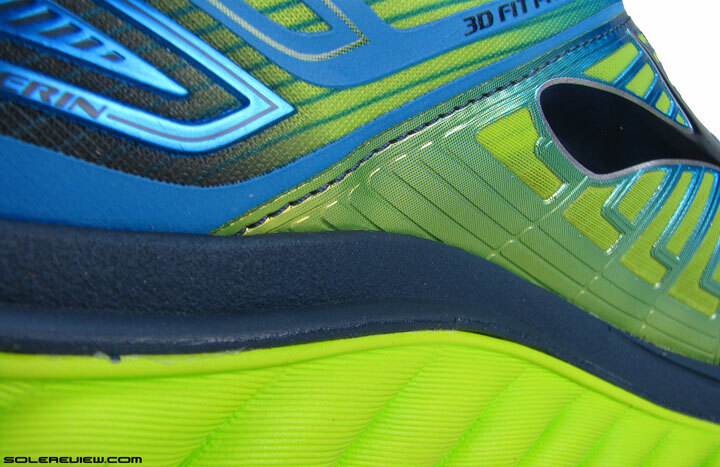 The smooth interior environs of the Glycerin 13. 1) Decreased medial forefoot space 2) Increased midfoot lockdown 3) Ride is softer overall. The second factor has most likely to do with the change in the position of the midfoot panel. 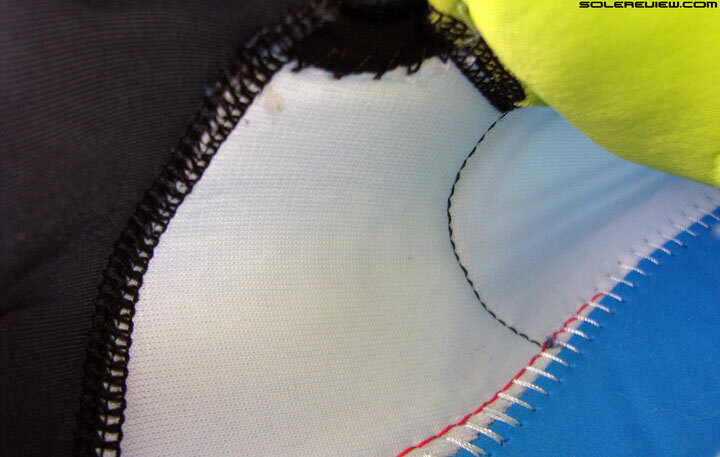 The base of the big toe (medial/inner side) feels more hemmed in by the upper than before, and it is probably because the synthetic midfoot piece has inched forward along with the lacing. Consequently, these two reasons combine to deliver a different forefoot fit experience than the Glycerin 12. There’s another angle to this. Both of these changes, along with the mesh swap – Glycerin 13 goes from an open spacer mesh to a closed type – makes the shoe slightly stuffy, and less breathable than the Glycerin 12. There’s enough space right at the front, toe-forward and vertically. Generous dimensions of the toe-bumper reserves adequate space around the shoe tip. This however, does not influence the amount of room at the very tip. Both the versions fit true to size, and there’s sufficient margins ahead of, and above the toes. The midfoot construction includes a sleeve/gusset to wrap the foot sides. Same as Glycerin 12. The sleeve material is semi-elastic. 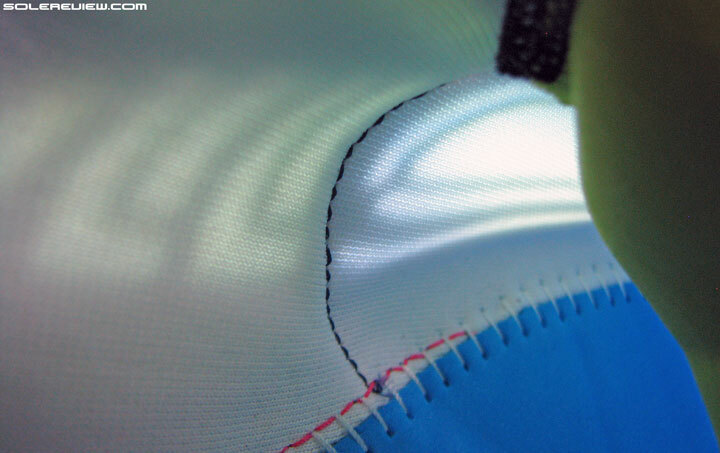 The inner lining/gusset is attached to the tongue , preventing sideways movement. The lacing pressure is noticeable, but not uncomfortable. The foam quilted tongue sees to that. There’s a half-sleeve/saddle/gusset wrapping the midfoot and keeping the tongue in place. This was the case on the Glycerin 12, so not much of a change. What has changed, however, is the level of lacing pressure. Simple reason – the Glycerin 13 has wider lacing spread over the foot compared to the Glycerin 12, and that increases the cinch pressure. But the tongue is packed plush with foam, so there’s no sense of discomfort, just the sensation of extra lockdown. The eyestay edge has a flat design, replacing the Glycerin 12’s corrugated build. This widens the gap between opposing eyelets, increasing top-down pressure. 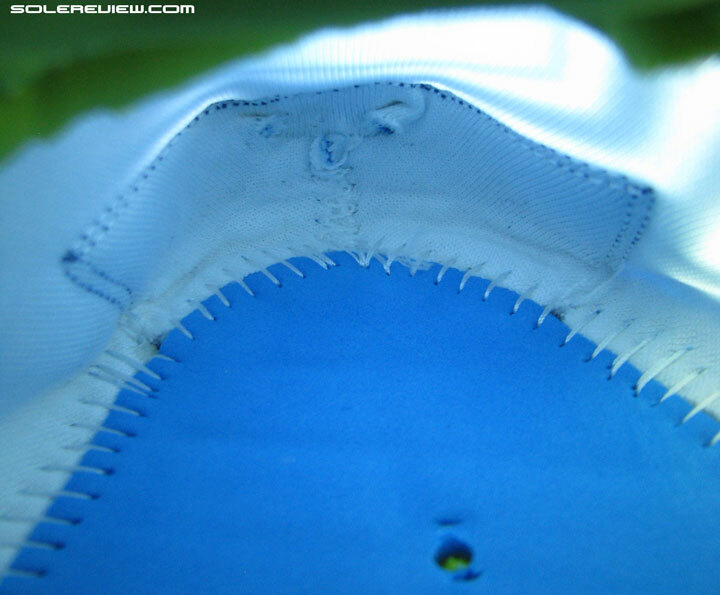 The difference in lacing width is brought upon by the change in eye-stay panel design. 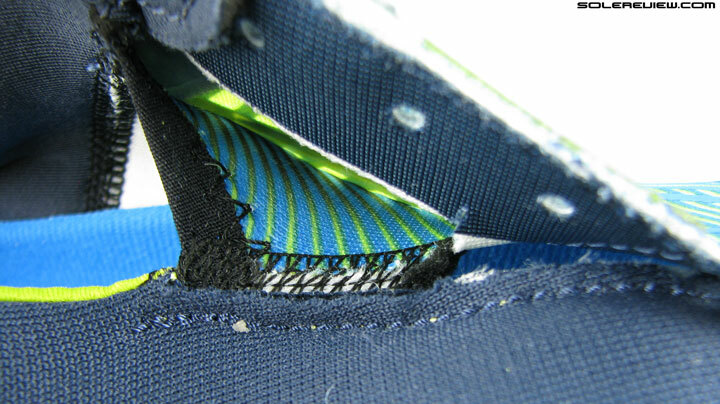 The inside edge of the panel on the Glycerin 12 had a rounded, wavy pattern to them, which brought the lacing ends closer. 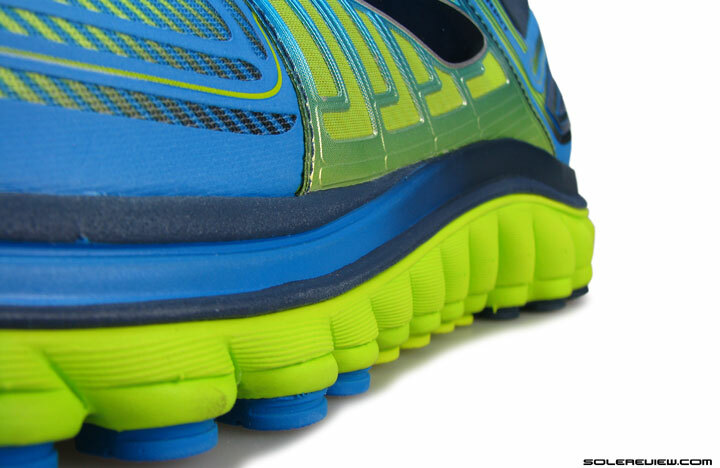 On the Glycerin 13, that changes to a straight design. Don’t get it? That is why we have plenty of pictures in our reviews. This one above shows this distinction clearly. Collar material is the same from previous year. Plenty of foam padding between those layers, and the lining feel is smooth. 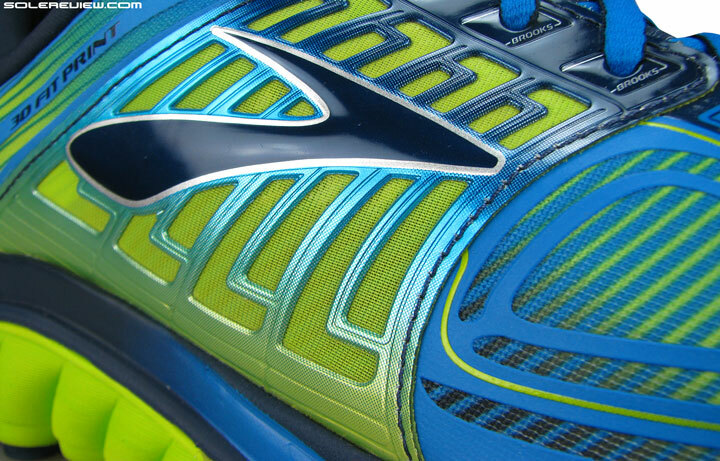 Glycerin 13 carries forward the heel lining material, and the same amount of foam padding inside. 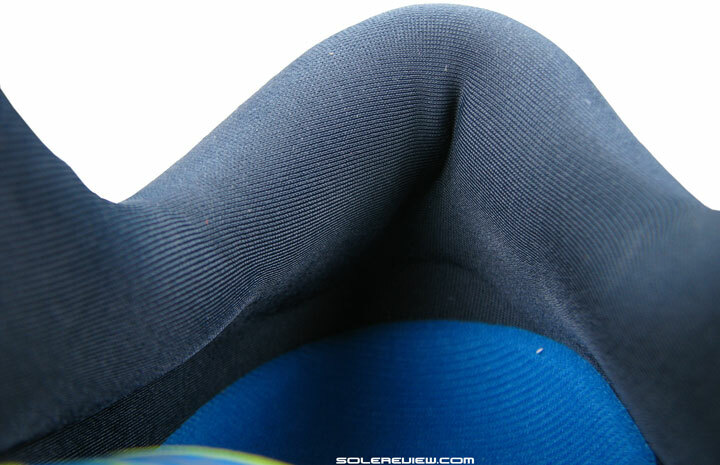 The collar area is smooth and the heel area grips well. That said, the 2015 model grips slightly more firmly around the Achilles dip. The revised heel overlay rides up higher on the heel than its counterpart on the G-12, making the Achilles dip firmer. 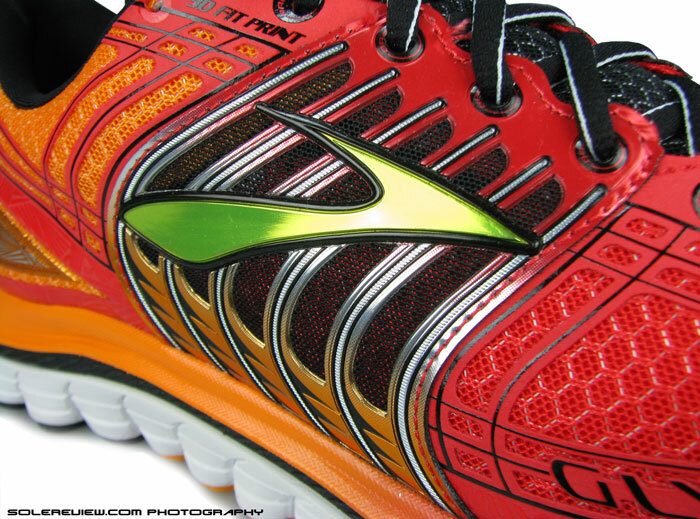 The Glycerin 13 gets an update on reflectivity (absent on the G-12). While both the current and previous Glycerin versions rely on a molded heel counter with similar construction and materials, the Glycerin 13 does one thing differently. 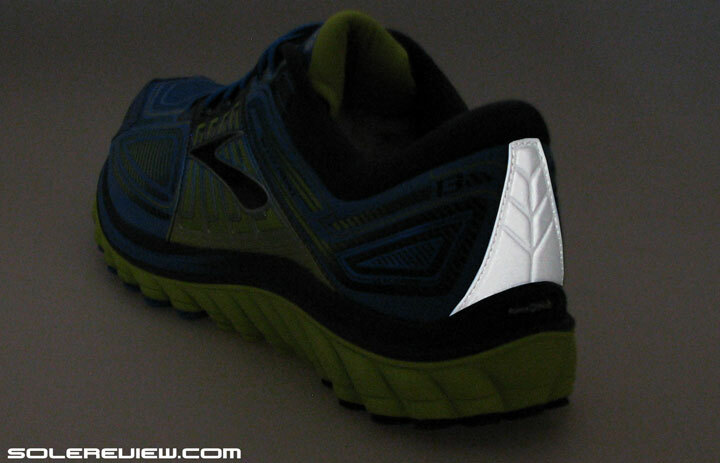 the heel back part now comes with a reflective panel stitched on it, and this part extends higher than its equivalent on the Glycerin 12. This change effectively reduces the area of soft collar just around the Achilles dip, making that part firmer and slightly increasing heel grip – just around that part. 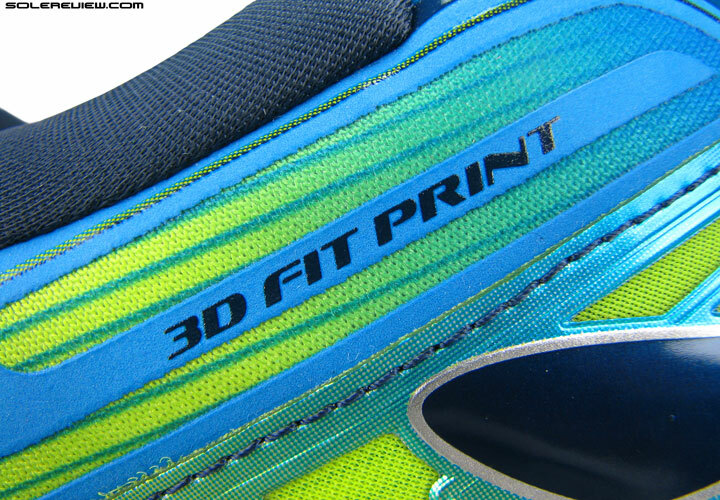 Rest of the shoe is a familiar sight; high density printing runs amok on the upper, as it did on the Glycerin 12. Mesh type gets swapped to a more close-knit structure. So that’s what you really need to watch out for when buying the Glycerin 13. Both the versions look deceptively similar, with all the no-sew layering which Brooks likes to call 3D fit print, and the shiny midfoot panels with the integrated Brooks logo. But the upper fits narrower in the forefoot, and the shoe rides softer. So can’t call this a minor update, not at all. The latest Glycerin is an improved Glycerin. And what we do we think of this year’s model? The fact that new Glycerin 13 has become truer to its former self is something to be appreciated – when the smooth plushness of the ride (Glycerin 9, 10) was a given, and not a bonus. The Glycerin 12 was trifle disappointing, and the new G-shoe, in its own way, tries to make amends. The number thirteen doesn’t have to be always unlucky, after all. 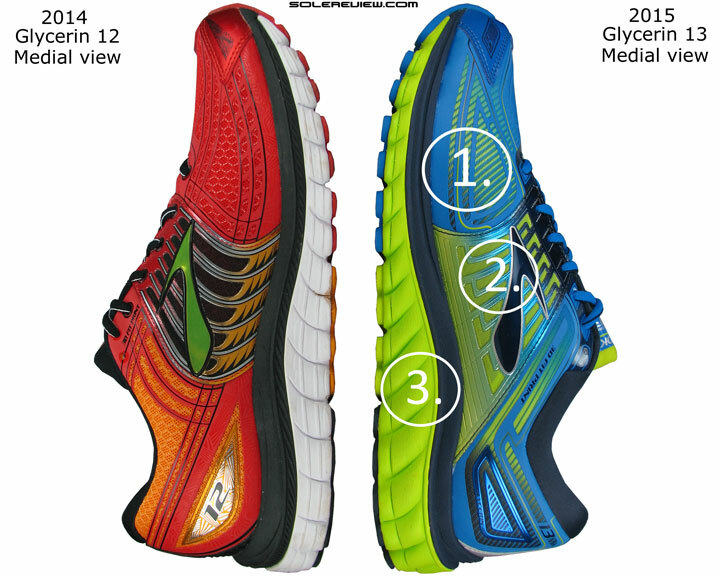 Looking to upgrade your older Brooks Glycerin 12 to the latest version, but not sure how the 2015 model compares? We can help here. The following infographic is a ready-reckoner for what changes you might expect in the new model vs. old. To make this more fun, we’ve put in a system of percentage match, which calculates a weighted average for a set of attributes. So glad I stocked up on the Glycerin 10. Sadly down to my last pair. Brooks has never been the same since then for me. The likes of Adidas and Saucony has pushed ahead with their Boost and Everun seems to be the attraction to my needs. How the mighty has fallen. Glad to see the upper of the Glycerin is still plush, but this Super DNA non-responsive foam needs to be replaced pronto. 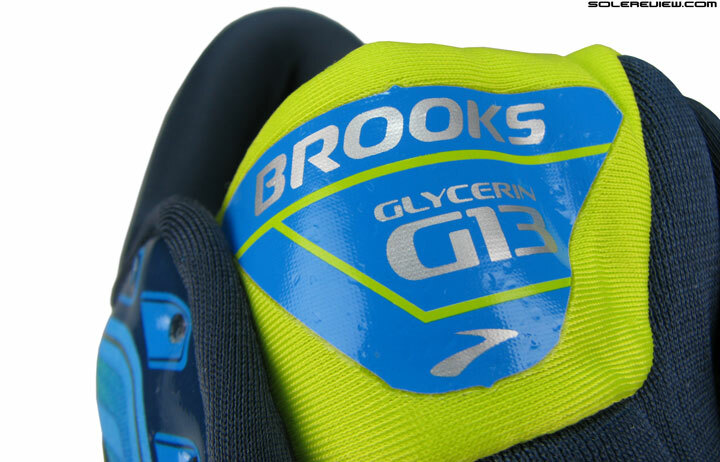 The Glycerin 9 and 10 were our favorite-st Brooks G’s. Looking forward to the Saucony Everun next month! I’ve had the G-13 for awhile now and it is an improvement on the 12. As you mentioned, it is softer than the 12. The 12 to me felt like running in cowboy boots. The 13 is better to run in. The upper on the 13 is fantastic, very comfortable. My main issue is with the cushioning, it is….well, if I had to use one word to describe it it would be “blah”. Not very inspiring at all. Just feels dead to me. Asics has the gel feel, Saucony’s power grid in the Ride has some energy return, Muzino has the pop of the wave plate, but the G-13 doesn’t seem to have anything going for it. Don’t know how long Brook’s is going to continue pushing this cushioning system, but I think I’ve learned my lesson and am going to stop buying it. Spot on, couldn’t have said it better ourselves. I got about 400km in my G11 before the cushioning got too soft/mushy ( i usually get 800km from nimbus ) and haven’t done enough km in my G12 yet for a verdict. While I am happy about the review saying the 13’s are an improvement I am not sure if I will roll the dice and get another pair…. How about trying something else? The upcoming Triumph ISO 2 sounds promising, Everun cushioning and all that. I’m a runner with 1,83m and around 98kg and run around 30-40km / week with around 6:00-6:30 Min./km … my G11 served me very well for around 800km, then I started to look around and bought / tried many shoes with no success, mostly because the upper start getting wholes. Some weeks before my marathon I bought a pair of not officially available G13, feels like coming home 🙂 … but after 300km they are completely done, the cushioning on the inner heel part simply gave up, dramatic pictures of running analysis to show. They are now at Brooks Germany for over two months, so far no response. Don’t know where to post this, but as you mentioned Everun, when do the Triumph 2’s come out for Saucony? November 2015. You could have posted this under the Triumph ISO page. I see tons of praise for the 9’s & the 10’s, but the first Glycerin I tried was the 11’s……fell in love with them, and have 5 pairs in my rotation. How does the cushioning on the 13 compare with the 11’s? I had the G2 or G3 way back when (don’t remember much about it), and I put some miles on the G8, which was a solid if unspectacular shoe. However, I found the G11 rock hard and basically un-runnable without an aftermarket cushioning insert. Eventually, I gave up on my pair after less that 100 miles. I’d guess that the G13 has got to be more cushioned that the G11 . . . but such things can be very subjective! The G13 is indeed softer, thanks! 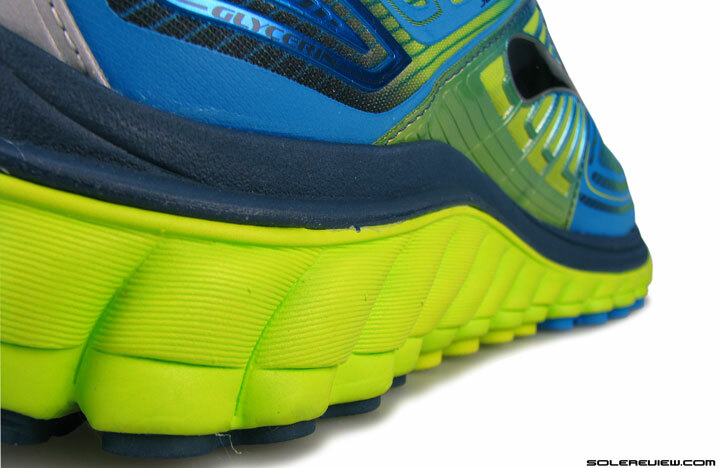 The Glycerin 13 rides softer than the 13, and the upper is more comfortable. I guess I’m in the minority here when it comes to the 12’s. I’m a “husky” runner and the Glycerin 12 was the best shoe I’ve ever run in. I really loved the cushioning. So I decided to try the 13’s and I love them as well. I do like the upper on the 13 better and they have a really plush feel when you put them on. Also, I feel like the shoe has a wider sole although looking at the two side by side it appears to be minimal difference at best. I would definitely recommend them to anyone. Appreciate the feedback! That is why running shoes are said to be a very subjective/personal choice. The Glycerin 12 wasn’t a bad shoe per se, only the ride felt a wee flat. Thanks for the review. I assume you probably would get this alot but I really am lost. So I made a rookie mistake and went for the name/style and splashed the cash on a Nike Air Max. I end up getting a knee issue which I never had before running for longer distances before in a 30€ Nike revolution. So my question is which shoe should I get, I have a rather flat foot, like the arch is so low you can barely see its there. I would really really be grateful for your help. Much appreciated. You could try shoes such as the Brooks Transcend, Saucony Hurricane/Triumph ISO, Asics Kayano 21/22 and the Nike Zoom Odyssey. No guarantee any of these options will work for you, but if we had to narrow down this list, we’d pick the Brooks Transcend and Nike Zoom Odyssey. Thanks alot for your response and guidance. I appreciate it. It’s quite difficult for an up & coming runner like myself to find my way through this maze of running shoes. Specially since here in Paris I feel that in the stores the commercial pressure gets to them and they end up recommending rather mainstream or popular shoes. So i’ll order online, probably will go with the Zoom Odyssey. Thanks again. Sorry for the double post but a little update. So I found this speciality running store. They make me run and see whats up and turns out despite having a flat foot/low foot arch I dont over pronate so like I dont neccessarily need the stability shoe. So he says either of th Brooks Ghost, Saucony Ride 8 or Nike Pegasus would be fine. Upon asking he said Vomero is good but with a bit more cushion than Pegasus. So after running in Vomero and the Ride 8 I think ill finally settle for Vomero. Just havent matched anything as comfortable as them. And to think of it their “Flagship” Air Max is 40 euros more expensive than the Vomero. Anyways, just thought it would be useful feedback. Thanks for your reviews. Love this website – the best shoe reviews, bar none. Reading this review, made me wonder whether Brooks have some new technology in the pipeline – it is obvious that SuperDNA is vapourware – nothing more than EVA with the DNA units removed. Do they have something more substantial to justify their expensive shoes in future? Final point – “making for a far more plusher ride” – you can’t say this – it’s either “far more plush” or “far plusher”. Thank you for the kind words, and for the catch! We know that our reviews contain typos or grammatical/syntax errors, so always grateful for an extra set of eyes to go over the copy! Not sure what the future holds for Brooks’s flagship cushioning system. We trawled the US patent database, but failed to find anything new. The existing DNA foam is so meh. I remember being a little miffed when Brooks switched from Hydroflow to DNA gel. Truth be told I didn’t find the ride much different when I went from G8 to the G9. I also didn’t find a huge difference between the G9. and the G11 (new upper not withstanding). Being only a 5k guy maybe the subtleties are lost on me. I also understand that ride quality isn’t synonymous with the exotics in midsole construction. But, like most people reading your excellent reviews I let a bit of OCD influence my shoe criteria and if asked to shell out close to $200 for a pair of runners, the manufacturer better meet my expectations. I think Brooks may be trying to have their cake & eat it too by marketing the Glycerin as an exotic but in reality it’s just standard EVA cruiser. I have a suspicion that the change in midsole, like the upper has more to do with lowering manufacturing costs & improving margins than advancing ride quality & technology. 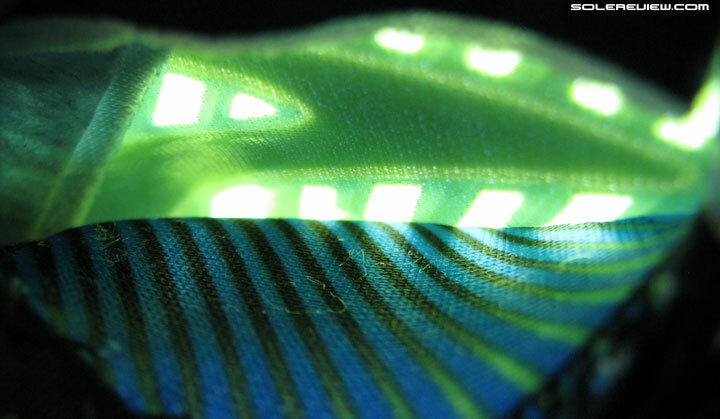 Absolutely – they must have saved money by switching to the all-foam midsole. But knowing how things are in far east from a labor perspective, they would have just managed to hold on to their previous margins. Any financial gains would have been offset by labor and material cost headwinds. I have been running on the Glycerin 11 model for years and love them. I chose not to go to the Glycerin 12 because of the changes they made. 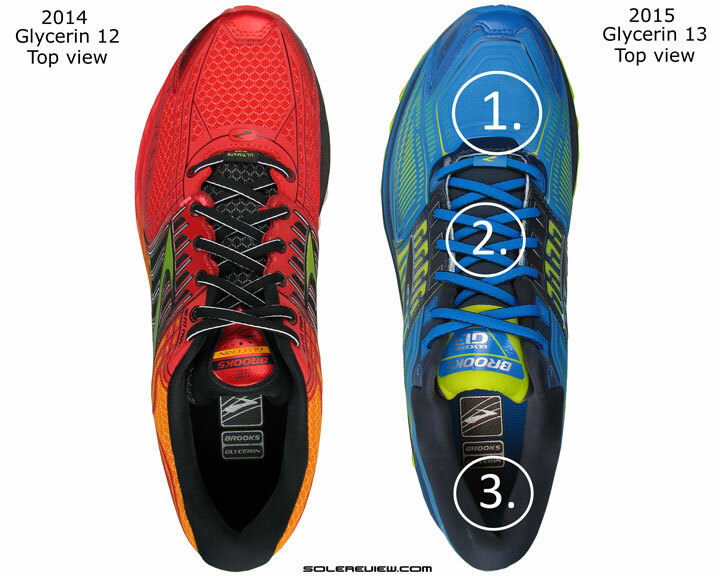 Sounds like the Glycerin 13 might be more like the old 11? I need a new pair and not sure if I should buy the older Glycerin 11 model or move to the new Glycerin 13 model. Anyone have any thoughts? Thanks. 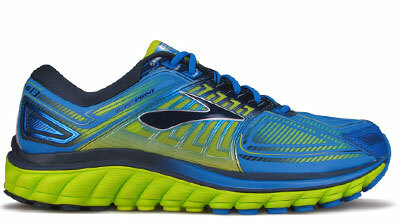 The Brooks Glycerin has fundamentally changed after the G-11, so all newer models ride differently. The G-13 isn’t bad at all, but you won’t get the 11 feel. So suggest you buy the Glycerin 11 if you can.